Approximately 100km of the Kerry Way is covered on Map 78. This map is on a scale of 1:50,000 and was last updated in 2010. The vast majority of the remaining trail can be found on Maps 83 and 84 while 1km portions can be found on each of Map 70 and 85. 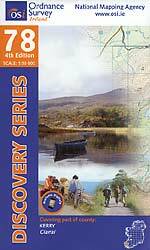 Discovery Series Map 78 contains the start and end sections of the Kerry Way, leaving the town of Killarney and going just beyond the coastal village of Glenbeigh and then the final stretch from Kenmare back to Killarney. Other popular details on this map include Carrauntoohil and the Macgillycuddy's Reeks, the Gap of Dunloe and the Killarney National Park and a large section of the Ring of Kerry Cycle Route.